The uncertainty of science: New survey data of the stars in the Milky Way suggest that the galaxy is not only corrugated with concentric ripples — like you’d see if you dropped a stone in a pond — it is also about 50% larger than previous estimates. 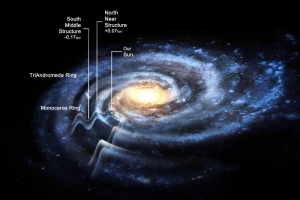 I have watched the size of the Milky Way fluctuate up and down depending on the research for the past forty years. Sometimes it is larger than expected. Sometimes smaller. Without doubt we are getting a better idea of its actual size, but don’t be surprised if the numbers continue to bounce about for decades, even centuries, to come. The confirmation that the spiral arms are the equivalent of ripples in a pond is also not surprising, as it confirms the intuitive conclusion of anyone who looks at a whirlpool-shaped spiral galaxy: It is a whirlpool spiraling into the gravity well at its center. Just thinking….Higgs field and the idea that the universe is in a super fluid. Could ripple be the waves expected in a super fluidized Higgs field? The idea of weak and strong forces predicted by Higgs Boson is not refuted. Are we seeing the physical evidence of the Higgs field theory in the ripple?